Welcome to the fourth appointment in the "Winter Garden" challenge organized by the lovely Francine from The Beauty case blog. Today's prompt is "giardino d'inverno" and has been proposed by Sara, so I went with a pretty matte butterfly design. Hello my lovelies! How are you today? Are you in the mood for some purple makeup? or is it just me? Hello lovelies! How have you started your week? Today I have an interesting product to show you is 5 pieces Nail Art Brush set of the brand N.Nail, that KKCenterHK sent me for review. I wanted this 5 brushed set because I'm decided to give a try to acrylic colours, after Raggio di Luna nails with such gorgeous nail designs makes me want to try so much! This set seems perfect for that purpose. Hello sweeties! How are you? I have an interesting review to share with you about a potent anti- aging eye serum. Elite serum contains "powerful peptides which work together to complete a proprietary formula that banishes fine lines and wrinkles, dark circles and under eye puffiness". It sounds good. Are you intrigued? Hello my sweeties! how is your weekend? I hope you're enjoying it! I'm like Braaaziiiil, lala lala lala la laaaa! Nope, I'm not getting ready for carnival, hahaha. I have great news to share with you: OPI Spring-Summer collection is inspired by Brazil!!! I can see here a couple of must have for Summer, check the shades for yourselves. This is the third appointment in the "Winter Garden" challenge organized by the lovely Francine from The Beauty case blog. Reading this morning a post by the lovely Liesl from Liesl loves pretty things (check her out if you haven't already!) I got tempted of doing the same thing she's done, that is writing about beauty things that one should or should not be doing according to some "rule". I truly believe the most important thing is being oneself and I want to share with you 5 beauty things I'm not apologizing for. Are you with me? I'm showing some love to my BH Cosmetics San Francisco Palette. I could see so many possibilities using this palette that I hesitated a lot before deciding what to do. I finally went with a mauve purple-y smokey eye look because I'm so fond of those colours. I do no hate winter. I just wish it was shorter. Around mid January I start longing for Spring, though this winter has been gentle in Swizerland so far, but I need sunnier and longer days. So today I have a BH Cosmetics palette to show you that to my eye is the perfect spring palette! Hello lovelies! Are you enjoying your Sunday? I've been a little ill the past days. Nothing too terrible, just the flu. I'm feeling a little better now, but I tell you although it hasn't been very cold around here, I already had enough of the winter. You can tell by looking at my nails! Today I have a sheet of Sweet Night View Oil Painting Water Decals provided by Born Pretty Store to share with you and this mani is really cheering me up. Hi my lovelies! Happy weekend! How are you? I was forgetting this little one among my untrieds! This little purple shimmer was bought last summer during my vacation in Italy, and I thought it was quite dark for my summery mood back then, so I thought I'd save it for later. I was almost forgetting about it, but today feels like a perfect day to show you this one! Today I was taking a look to my everyday makeup items and noticed many products have changed in my daily makeup routine. And it's been two months since I last shared my make up bag contents with you. My current look is very pink-y and quite dewey! I'd love to have your feedback. You know how textured polishes are so in vogue lately, they are here and there, and everywhere. OPI just released a new collection by Gwen Stefani with a matte, a satin and a chrome finish. Gorgeous and chic. What does all this tell you? Yep, NO TOPCOAT! does that mean endless drying time? Hello my dears! Today begins a new challenge organized by the lovely Gold Francine from The Beauty case blog, most of the participants are Italian so the challenge is called "Giardino d'inverno" which means "winter garden", how cool is that? EOTD: BH Cosmetics Hollywood palette, who said green eyes can't wear blue? Hello sweeties! How are you doing? Today I have a cool makeup look I've done using the BH Cosmetics Hollywood palette that I've reviewed recently here. This review is several months overdue! It's about a very pretty palette I got last year at the beginning of Fall from a brand that was new to me called BH Cosmetics. 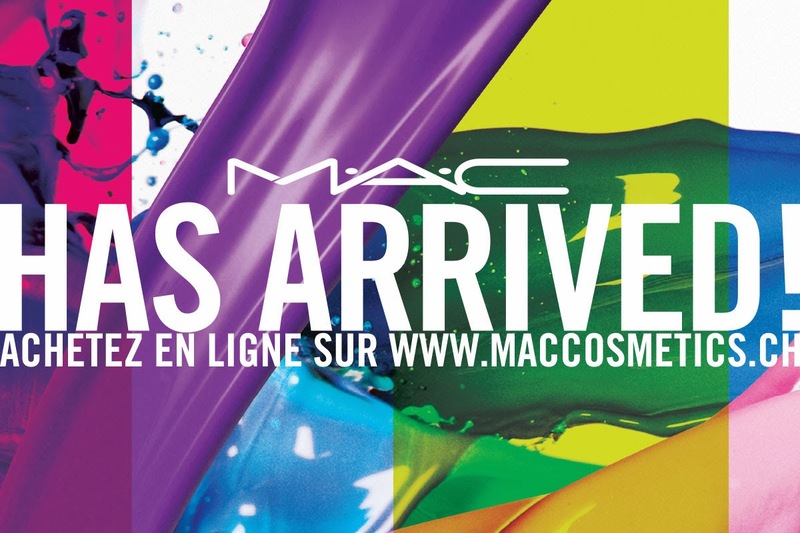 I had been hearing and reading lots of good reviews about this brand, they're so freaking affordable with unusual bold colours and outstanding pigmentation. I went many times to their site to see the famous "120 colours palette" and honestly that was not for me. But one day I received this awesome news about three very compact palettes with eyeshades and blushes, all 3 for less than 15 USD and I jumped headfirst into it! Hello my lovelies! How has your week started? I'm destashing! 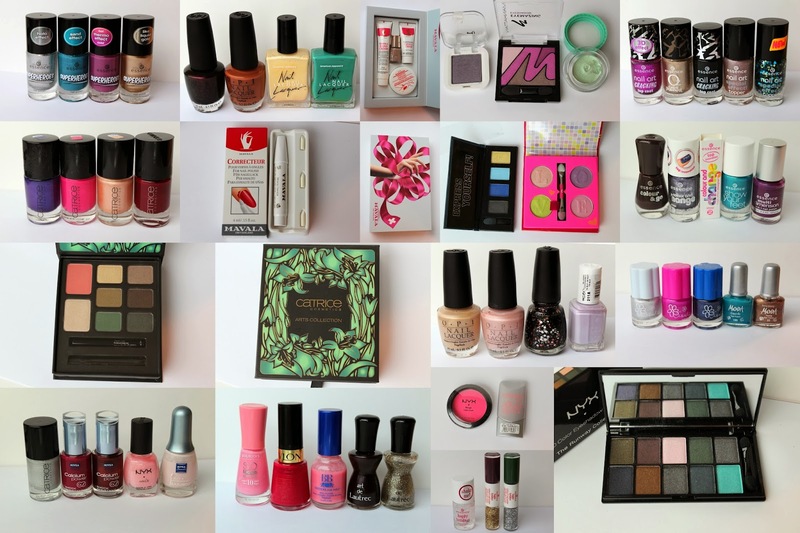 These are some nail polishes and makeup pieces which don't have their room in my stash any longer. I'm sure there is somebody out there ready to show them some love! Peeling the 2013 skin off!! I do apply a face mask treatment every now and then, but nothing like this. I was quite curious to try one of these masks because the brand sounded utterly good, and I'm so glad I did! I couldn't wait to share this with you my lovelies. Be warned there's some bare face pictures of me, don't be shocked, LOL! hahaha. Hello my dears! It's time to bring out all those empty bottles and packages again! Ok, ok, this is blatant self promotion... I admit it! Well, what can you do? It's probably very wrong to be proud of oneself, but I truly am. Last week I learnt thanks to the kind comment of Melissa from Lacquer reveries that one of my nail designs appeared in the January/February issue of Nail It! Magazine, and I wanted to share the good news with you. 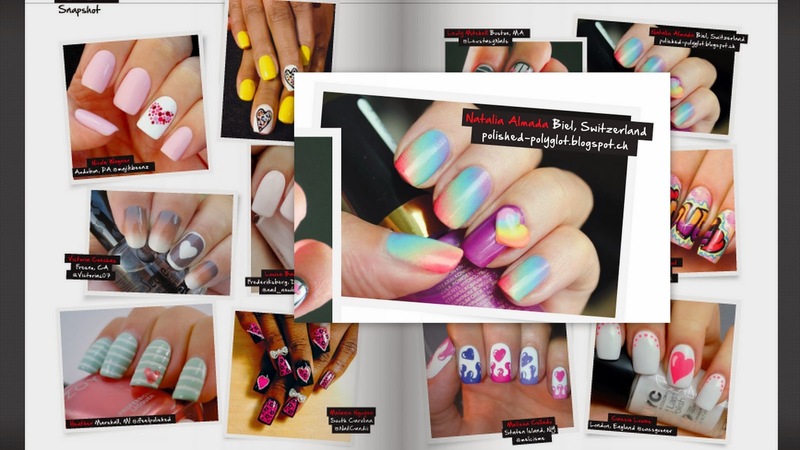 I can hardly believe my design appears next to so many great nail artists, this makes me really happy!